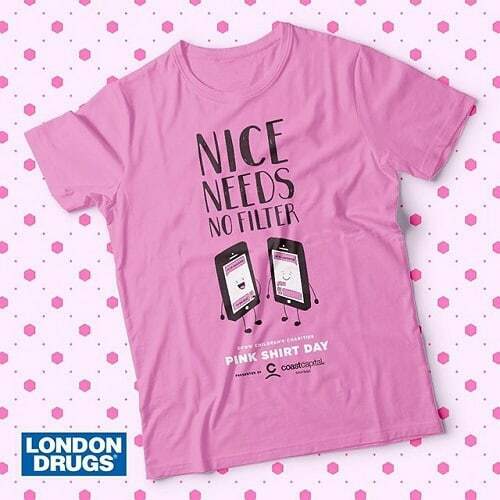 This Wednesday, February 28th, 2018 is #PinkShirtDay and you can get your Official Pink Shirt Day shirts at your local London Drugs or online at the Official Pink Shirt Day website. 100% of net proceeds from official merchandise are donated to programs supporting children’s healthy self-esteem, teaching empathy, compassion and kindness. For 2018, the focus is on #CyberBullying. In today’s digital world, it can be impossible to escape online bullying, whether it takes the shape of harassment, spreading rumours, sharing embarrassing information or threats. 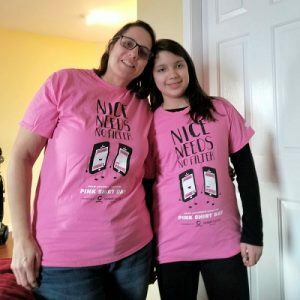 This year, Pink Shirt Day is encouraging others to combat cyberbullying by thinking twice before posting something negative, and instead using the internet to spread kindness – because we know that Nice Needs No Filter! Did you know that 2/3 of youth have faced bullying over their cell phones or online? Stand with us this #PinkShirtDay against cyberbullying. If you, or a friend, are being bullied online, visit our website to learn how to help make it stop. Link in bio. Help stand up against all forms of bullying and support Pink Shirt Day this February 28th. You can also Donate to the Pink Shirt Day Campaign.